HE AIN’T heavy, he’s my bubba. A recent incident in the Addo Elephant National Park has highlighted the extraordinary intelligence and caring nature of elephants. Speaking to The Herald on Friday, Port Elizabeth resident Ian McFarlane described how he and his wife Debbie were visiting the park with friends. They had stopped at Hapoor Dam where a herd of elephants was congregated and, between the forest of pachyderm legs, they spotted a calf, he said. 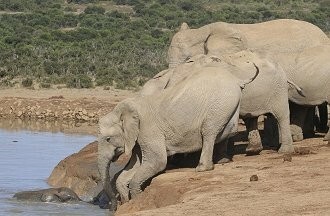 An honorary ranger on the scene diagonosed the uproar: the calf had fallen into the dam. The McFarlanes and their friends drove around to other side of the dam to get a better vantage point and got a clear view of the drama which ensued. 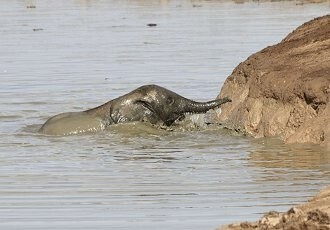 "The calf was battling to get out but it didn’t have a hope of doing so because of the steep slippery bank. 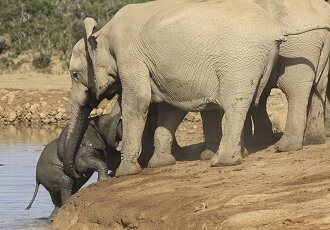 One of the adults – we think it was the mother – was reaching down with her trunk. The other adults were bunched around her, like they were offering moral support. After that, you could almost read the mother’s mind, Ian said. Lowering herself into the water, she waded up next to her calf – who for a scary moment disappeared completely under the water. Then, coaxing and nudging, she eventually got it up the bank and onto dry land. It was an amazingly dramatic event and a great photographic opportunity but it had been distressing to watch the calf floundering in the water, Ian said. Ian said he and Debbie have toured extensively in Southern African Big Five parks including Namibia’s Etosha and, in South Africa, Addo, Kruger and Kgalagadi, but they had never witnessed an incident of this kind before. Incidents like this had happened occasionally in the park through the years and very occasionally rangers had intervened to help, but most of the time the calf was rescued by the mother and the herd, he said. The incident had an amusing ending, Ian recalled. Some 10 minutes after the calf had been rescued, another very young animal wobbled over to the edge of the dam – only to be promptly herded away by a very protective mother.